The United States, South Korea and Japan were making a public display of solidarity Thursday over the outcome of Trump’s summit with North Korea’s Kim Jong Un. U.S. President Donald Trump promised to end “war games” with South Korea, calling them provocative, after meeting North Korean leader Kim Jong Un on June 12, 2018. His announcement appeared to catch both South Korea and the Pentagon by surprise. 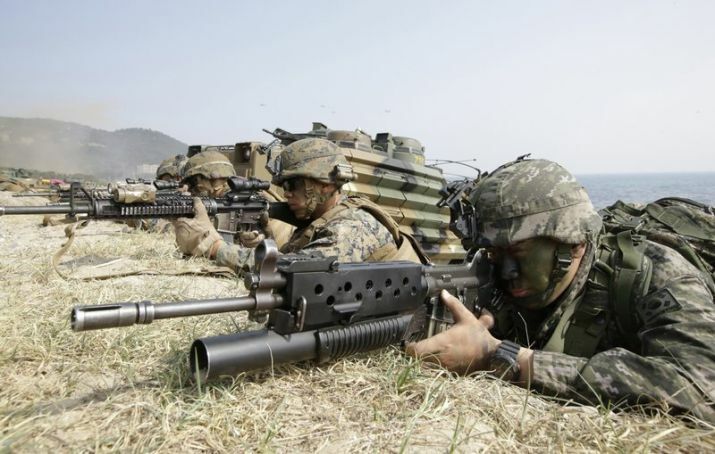 Washington: President Donald Trump’s decision to suspend major U.S. military exercises in South Korea could weaken allied defences, depending on the length and scope of the hiatus. But the potential for diplomatic damage seems even greater. The United States, South Korea and Japan were making a public display of solidarity Thursday over the outcome of Trump’s summit with North Korea’s Kim Jong Un. But analysts and former officials with experience in U.S.-Asia policy were shaken by Trump’s failure to inform the Asian allies — or even the Pentagon — before mothballing the military manoeuvres. “Those exercises are critically important because they are deterrence,” said Chuck Hagel, a former defence secretary in the Obama administration. He welcomed Trump’s willingness to talk to Kim but worried that the president has underestimated the complications he has introduced for the Pentagon by suspending the military drills. In further explaining his reasons for suspending major exercises, Trump said they “cost a fortune,” though even the Pentagon, which foots the bill for U.S. participation in all such manoeuvres, has been unable to say what they cost. Defence Secretary Jim Mattis’ office on Wednesday sent out a request to military commands for cost estimates for the main military exercises held on and around the Korean Peninsula, according to officials who spoke about the request on condition of anonymity to discuss internal communications. In the past, some estimates for smaller exercises have been about $2 million, while some larger ones have cost $15 million or more - all relatively minor expenses for a department with a budget now exceeding $700 billion. Secretary of State Mike Pompeo, meanwhile, briefed his South Korean, Japanese and Chinese counterparts on the Singapore summit. At a news conference in Seoul, Pompeo said “staying closely aligned with our allies ... will be critical” to success with North Korean denuclearization, but he had nothing to say about the suspension of military drills. The White House has said that the manoeuvres were suspended “in a show of good faith,” for as long as productive negotiations with the North continue, and that “regular readiness training and training exchanges” will continue. The Pentagon, however, has remained silent on what Trump meant and hasn’t confirmed it will cancel or postpone the Ulchi Freedom Guardian exercise.